The words ‘getting it right’ have possibly become a cliché for most small businesses who wish to survive. What I have found over the years, however is that the essence of those three words lies in trust. Getting it right has to stem from a mutual understanding and trust between client and maker. To enable the maker to get it right, he or she party relies on the client’s honesty and willingness to express what they like, what they don’t like, what they feel. It’s a willingness to work closely with the maker. That first meeting is so important. If the client doesn’t feel comfortable and isn’t given enough time, the maker might never get to understand that person’s vision. It is this core spirit that needs the attention and thought. This is the essential spark that could ignite an idea. The client also needs to trust the maker; the maker is the expert after all, but must not be too big-headed about this! – they should be willing to listen, to adapt, or at least try to improve and make their client’s wishes work. This team-ship and collaboration is exquisite. The maker is doing something out of their comfort zone and therefore will naturally put more effort in, and the result should be better than what the client had originally imagined. However, there might be more than one maker. What if the client is shown around the workshop and listened to by one maker, and their stone is then designed by another and carved by yet another? Something would no doubt get lost en route to completion. The essence and trust might be diluted and the finished stone might lack the understanding of the original thought. If the client is confronted with this potential situation, they will invariably ask “I don’t want to appear rude, but can it be you who carves the headstone and not him, or her?” expressing that once they have opened up and displayed their feelings and given their time to the maker, they would expect that same maker to execute the work. This is fair enough and they’re right to feel this way. The truth is that in a big workshop situation with lots of apprentices and letter- carvers there will always be mixed strengths. Some are good at listening and clients will talk easily and feel comfortable. Others will be better at big lettering. Some will be better at italics. 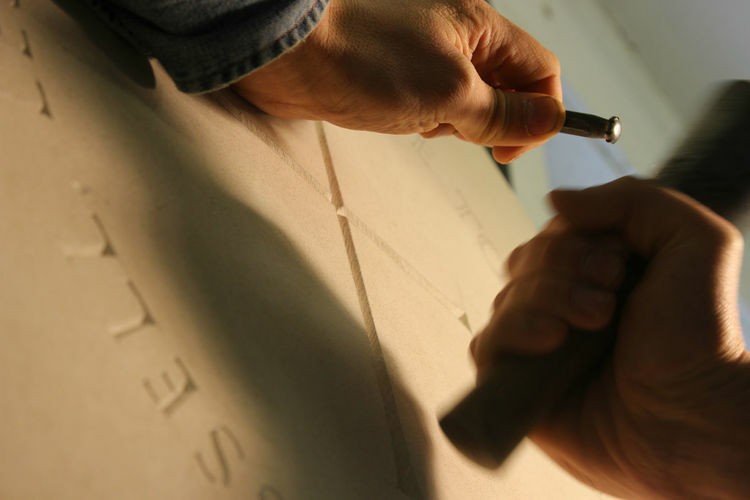 The general rule is that the person who meets the client should also design the stone, and overlook the whole process from start to finish, but not necessarily carve it. The marvellous saying: ‘the worker is hidden in the workshop’ –carved on David Kindersley’s memorial, means that the workshop runs as a whole. We all carve the same letters- the same quality. 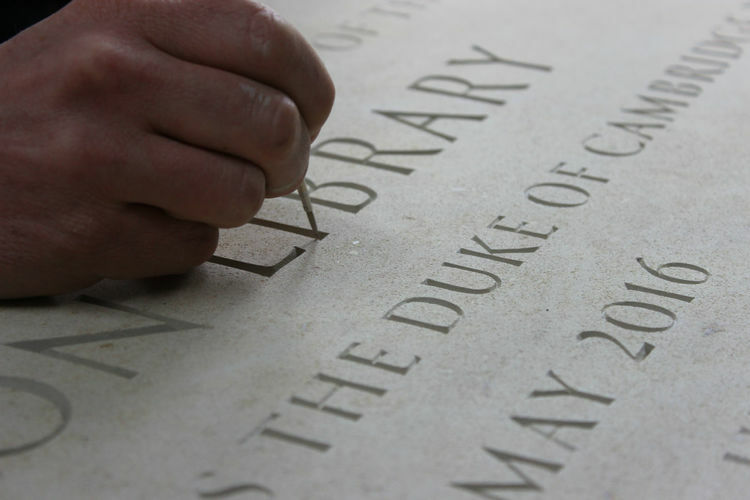 Occasionally we will be working on a big inscription all working together and require the skill to be able to carve all the same S’s and B’s. Our biggest dread as a letter-cutting workshop is the prospect of a client being dissatisfied and not pleased with the finished stone. In order to avoid this, we like to include the client in the various stages: meeting, design - this can be changed as many times as needed, drawing out - the client will come and see the stone at this stage, and any last minute changes can be considered, sometimes the pencil is even given to the client which evokes an intimacy with the process. What I have found over the years through letters of thanks, is that this process that the client goes through sometimes has a therapeutic effect. It is a journey that the client has felt part of, and when this happens, I feel we have got it right. 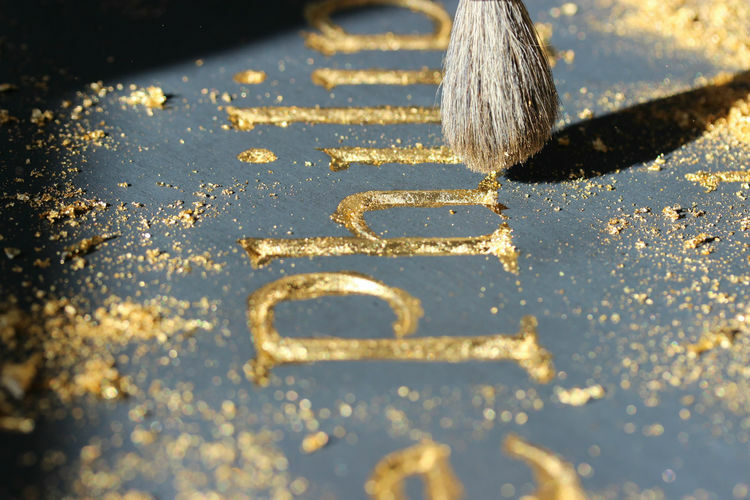 Bespoke Headstones - have you seen such unique designs? Hand Carved Memorials- What makes ours unique?